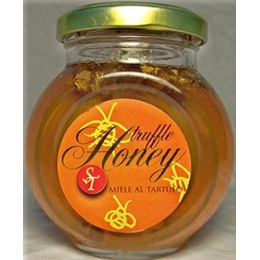 Acacia Honey with white truffle. Imported from Italy. Packaging may be different than pictured. Ingredients: Acacia Honey, White Truffle (Tuber Albidum Pico) 1.5%, Flavour. Suggested Use: Excellent as a starter spread on toasted bread together with ham or pecorino cheese, put on your cheeses, such as brie, as stuffing for crepes or spread on fruits cooked in butter. Makes an awesome glaze for ham. There are many uses for this product. Honey may be crystallized but it is still good, just warm it up to melt it. Honey may be crystallized but it is still good, just warm it up to melt it.